Richmond, VA – October 6, 2015 – The Fahrenheit Group is conducting the Mid-Atlantic Total Compensation Survey for Small and Middle Market Companies. Now in its 25th year, the survey provides the most comprehensive information regarding competitive market-based salary and incentive data, salary adjustments, cash and equity incentive plans for executives and technical professionals, and trends in human resource practices and employee benefit plans. Small and middle market firms are invited to participate by completing the survey questionnaire no later than October 23, 2015. Participate now by accessing the survey here. Participating companies receive a free copy of the summary results in November. Non-participants may purchase the results for $400. For the 2015 – 2016 survey, the summary report provides salary and incentive data for 50 benchmark jobs. In addition the report provides salary adjustment, annual and equity incentive plan, human resource management practices, and employee benefit plan prevalence data. The foreword to the summary report will be written by a notable Mid-Atlantic entrepreneur in the final survey report. 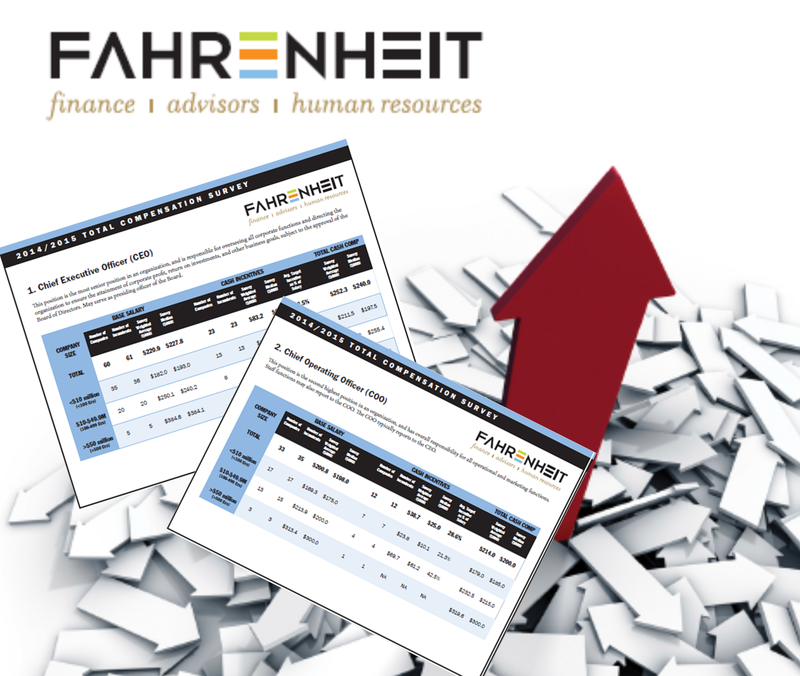 Questions concerning the survey should be directed to totalcomp@fahrenheitadvisors.com or (703) 673-9431. The Fahrenheit Group is a full-service advisory firm that helps growth-oriented organizations overcome their most challenging hurdles to success. Our team is comprised of senior business leaders and consultants with real-world experience in three practice areas – Accounting and Finance, Business Advisory and Human Resources. We leverage the extensive knowledge of our team to understand clients’ true needs and implement practical solutions. Fahrenheit’s clients range from non-profits to early-stage to middle market and Fortune 500 companies. Founded in 2010 in Richmond, The Fahrenheit Group has been selected as one of Virginia Business’s Best Place to Work in 2014 and 2015 and has offices in Reston, Richmond, Raleigh-Durham and Phoenix. « Do Annual Reviews Really Foster High Performance?